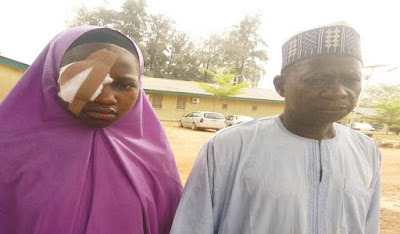 Raliya Suleiman, a 14-year-old Junior Secondary School female student of Government Secondary School, Kachia, Kaduna State, was said to have been blinded in her right eye while being flogged by a teacher for coming to school late. She was allegedly hit in the eye by the cane before she lost her eyesight. Raliya, who is currently receiving medical treatment at the National Eye Center Kaduna, is crying out for justice and assistance. 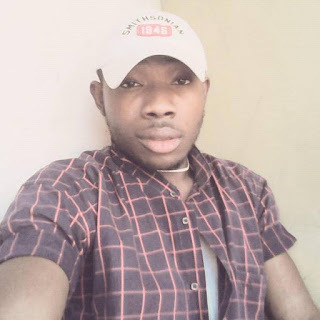 The police in Kaduna have confirmed the incident, as Police spokesperson Assistant Superintendent Aliyu Usman said "the case was reported at Kachia police division and is currently under investigation." Raliya's father, Sulieman Umar Kachia, told Daily Trust that “On 23rd February, 2017, the teacher, who was also the school’s discipline master, used a cane with several iron balls tied to it to beat my daughter and in the process the cane hit her right eye and destroyed it. “I reported the case to Kachia Police Division and the teacher took her to Kachia General Hospital, from where we were referred to National Eye Center in Kaduna. When we got to the National Eye Center, we were told that her eye lenses had been destroyed and she cannot see with the eye. The only treatment they gave was to adjust the eyeball from falling into her skull and to stop the bleeding." He however said some medical officers at a private eye clinic in Kaduna said they can restore the eyesight but "they demanded for a deposit of N1 million. Where do I raise N1 million from? Even if I sell my house and the whole of my harvest, it can't be up to that amount. It’s even my relations that are paying the bill at the National Eye Center now. "I am appealing to the Kaduna State governor, the police and relevant agencies and well meaning Nigerians to please come to our aid. We are also seeking justice for the unjust treatment by the teacher who purposely blinded my daughter." The victim, while narrating the incident to our reporter, said the discipline master, had asked 20 of them including the head girl to meet him at the school’s laboratory. "He ordered all of us to roll on the dusty floor of the laboratory, and started beating each of us with the cane attached with iron balls. I told him I was sick and have injuries on my back, but he insisted on beating me until the cane hit my right eye and blood started coming out. "The doctor said I will never see from the eye again unless I am taken abroad for proper medical attention. I am missing school because of our frequent visit to hospital," she said with tears. Continuing she said "Even after he injured me, he did not stop beating me until other students started shouting and a female teacher rushed in and stopped him. Some teachers in the school have been complaining about the way he beats and injures students indiscriminately." The Muslim Students Society of Nigeria (MSSN), which has taken up the case and promised to see to its logical conclusion, described the act as unjust and inhuman. President of MSSN, Kaduna State chapter, Sabi'u Shitu, while addressing a press conference in Kaduna, alleged similar acts of "inhuman treatment" perpetrated on students without intervention from authorities.